For more recipes, info and tips & tricks,sign up for our newsletter. The marriage of grapes and sausages is classically Umbrian. As the grapes cook with the sausages, they absorb the flavor of the meat and let out their own sweet juices, resulting in a memorable combination. Recipe adapted from Rustico: Regional Italian Country Cooking. Heat the olive oil in a 12-inch skillet. Add the sausages, pierce with a fork to prevent bursting and cook over medium heat for 10 minutes, or until browned on the outside, turning often. Add 1/2 cup of water and cook until the water evaporates, about 5 minutes; the sausages should be done. If they are not, cook longer. Remove the sausages from the pan and keep warm. 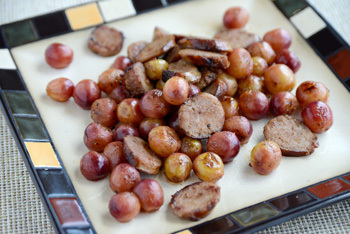 Discard the fat from the skillet, add the grapes and raise the heat to medium-high. Season with the salt and pepper and cook, stirring often, for 5 minutes, or until just starting to soften. Cut the fennel as thinly as possible for the most delicate texture and flavor. Heat the olive oil in a 14-inch skillet over a medium-high flame. Add the chicken pieces and cook until browned on both sides, turning once, about 5 minutes per side. Season with salt and pepper; add the garlic and rosemary; cook 2 more minutes. Deglaze with the wine, lower the heat to medium-low, and cover; cook the chicken 15 minutes, adding a little warm water if the liquid dries out. The pork emerges super-tender from its puff pastry crust, delicately scented with cinnamon, cloves, juniper, and allspice... quite an elegant presentation. Marinate the pork: Toss the pork tenderloins with the remaining ingredients except the salt in a bowl, and rub well to coat thoroughly. Cover with plastic wrap and refrigerate 24 to 48 hours. When you are ready to bake, rub the pork tenderloins with the salt. To bake: Preheat the oven to 400 degrees (preferably set on convection bake). 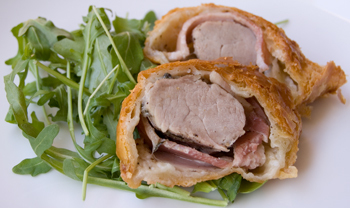 Roll each tenderloin tightly in the puff pastry and seal the edges of the pastry to enclose completely (excess pastry should be trimmed). If you like, wrap the tenderloins first in Pancetta. Brush the puff pastry with the beaten egg and place, seam side down, on a parchment paper-lined baking sheet. Roast the pork in the preheated oven for 30 minutes, or until the crust is golden-brown and the pork registers 170 degrees. Serve these succulent ribs over mashed potatoes or a side of creamy polenta. Dredge the short ribs in 1/4 cup of the flour and shake off excess. Heat the olive oil in a 12-inch ovenproof saute pan over a high flame. When the oil is hot, add the short ribs and cook until evenly browned on all sides, turning as needed. Season with 3/4 teaspoons of the salt and 1/8 teaspoon of the pepper. 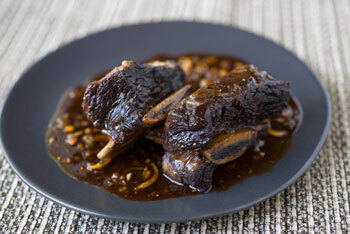 Remove the short ribs to a plate. Add the onion, carrot, celery, garlic, and parsley, and season with the remaining 1/4 teaspoon of salt and the remaining 1/8 teaspoon of pepper. Cook 10 minutes, or until the vegetables are soft. Add the wine and scrape up any bits that cling to the bottom of the pan; cook until the alcohol evaporates and the wine reduces to a syrupy glaze, about 5 minutes. Stir in the remaining 2 tablespoons of flour and cook 3 minutes, or until the flour loses its raw smell. Add the bay leaf and broth and bring to a gentle boil. Return the beef ribs to the pan, and cover with a tight-fitting lid. Braise 3 hours, or until extremely tender, adding a bit more broth as needed to keep the ribs moist. If the sauce is too thin when the ribs are done, remove the ribs to a platter, cover with aluminum foil to keep warm, and reduce the sauce, uncovered, over high heat. I love serving grilled meats, particularly pork or lamb chops, over grilled peppers marinated with olive oil, basil, marjoram, and garlic: the peppers' sweet flavor balances the smoky meat perfectly. While you can use any color pepper you favor, I prefer orange, yellow, or red peppers (or a mix of all three) and avoid green peppers, which are not quite sweet enough for this dish. Make the pepper salad: Heat a grill to a high flame. Grill the peppers until the skin is blackened all over and the flesh is soft, about 15 to 30 minutes, turning every few minutes with tongs to cook evenly. The peppers should be nearly collapsing when done. Remove to a bowl and cover tightly with aluminum foil. Set aside for 30 minutes; the steam that will be created in the covered bowl will help loosen the skin from the flesh of the peppers. Uncover the bowl and slip the skin off the peppers with your fingers; even if you are tempted to run the peppers under cool water to remove bits of clinging skin, don't do it: you would be rinsing away the delicious smoky flavor. If needed, use a clean towel to wipe away clinging bits of skin from the peppers. 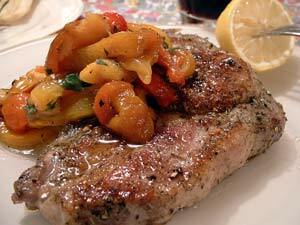 Grill the chops until browned on one side, about 5 minutes. Turn and grill until browned on the other side and cooked all the way through, about 5 more minutes. The total cooking time will depend on the thickness of the chops, the strength of the flame, and how far the chops are from the flame. I rarely marinate meat with salt. Salt draws out moisture from food, and if added to meat hours or days before cooking, can make the meat tough once cooked. (Just think of a tomato salad: you sprinkle the cut tomato with salt, and suddenly the tomato's juices start to seep out.) The only exception to the no-salt rule in marinades is a salt brine, like the one that follows in the recipe below. Brines are saltwater solutions in which meat soaks for hours or days; the purpose is as much preserving the meat as tenderizing it. But why should a saltwater solution tenderize rather than toughen meat, if salt draws moisture from meat? The key to understanding this paradox is osmosis, or the equilibration of water between the meat and its environment. If the environment of the meat is a marinade which contains dry salt (with or without oil, acid, and spices), through osmosis, the water from the meat will flow out of the meat, thus dissolving the salt in order to achieve equilibrium of water. If the environment of the meat is a brine which contains salt, but at a lesser concentration of it than the salts present in the meat cells, the water from the brine (not the salt) will flow into the meat in an attempt to achieve equilibrium of water. Make the brine: Combine all the ingredients except the pork tenderloins in a pot and cook over medium heat until the salt and sugar dissolve, about 5 minutes. Cool to room temperature. Place the pork in a deep container. Pour the cooled brine over the pork and cover; the pork should be completely covered in the brine. Add more water (and additional salt and sugar following the same proportions outlined in the recipe) if it is not covered in brine. Refrigerate 24 hours. Drain the pork, discarding the solids from the brine. Place the pork tenderloins in a roasting pan. To roast the pork: Preheat the oven to 475 degrees (preferably set on convection roast). Rub the pork with the olive oil, fennel seeds, pepper, and chili pepper. Scatter the rosemary, thyme, and sage over the pork and roast in the preheated oven for 15 minutes, or until the pork registers 170 degrees. Remove to a board, cover with foil, and let rest 10 minutes. Meanwhile, make the tomatoes: Toss all the ingredienst in a bowl. 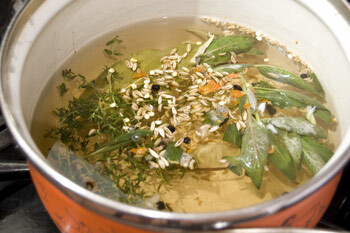 The same heady herb marinade can be paired with rib-eye steaks or chicken breasts. Combine the olive oil, rosemary, pepper, garlic, lemon zest, and mustard in a shallow dish. 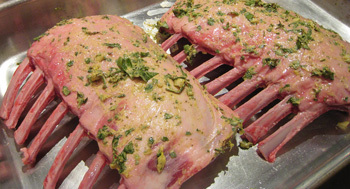 Rub the mixture on both sides of the lamb chops, coating well. Refrigerate for up to 2 days (or marinate up to 2 hours at room temperature; the longer you marinate the meat, the stronger the herb flavor will be). When you are ready to serve, preheat the oven to 500 degrees. Rub the lamb chops with the salt. I find beef chuck roast to be the ideal cut for pot-roasting; it results in tender, melt-in-the-mouth meat and succulent, rich juices. I like a lot of freshly ground black pepper in this dish, but you can use less if you are not as fond of pepper. Marinate the beef: Place the beef in a deep, wide container. Add the pepper and rub well to coat all over. Add the carrots, onions, garlic, thyme, bay leaves, parsley, juniper berries, and mace, and refrigerate 48 hours, turning once in a while. Marinating the beef with the aromatic vegetables and herbs for a few days tenderizes the meat and flavors it deeply; if you are in a hurry, you can skip the lengthy marinating time... but if you can plan ahead, do marinate the meat, and you will be amply rewarded with superior flavor and texture to your pot roast. When you are ready to cook, remove the beef from the container; set aside the solid ingredients (the carrots, onions, garlic, and herbs) from the marinade for later. Heat the olive oil in a deep, heavy pot over a medium-high flame. An enameled cast iron pot or Dutch oven are ideal; a light, flimsy pot will not work, and will result in dried-out, burned meat and thin juices. Add the beef and cook until browned all over, turning as needed to cook evenly, about 20 minutes. Add the reserved solids (the carrots, onions, garlic, and herbs) from the marinade and cook 10 minutes, or until the onions soften. Season the beef and vegetables with the salt. 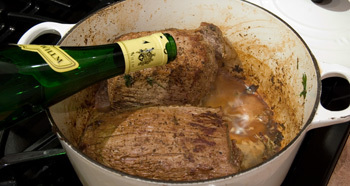 Pour in the wine and cook 5 minutes, scraping to dislodge any browned bits from the pot. Pour in the brown chicken or beef stock, bring to a gentle boil, and lower the heat to low. (For a step-by-step recipe for brown chicken stock, click here.) 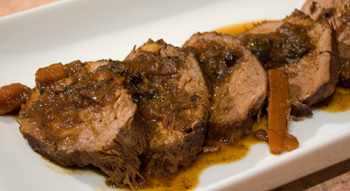 Cover the pot tightly and simmer for 5 hours, or until the beef is fork-tender and the vegetables are soft. p> Check on the beef once in a while to make sure there is always some liquid in the pot; if the liquid evaporates during cooking, add a bit more as needed. 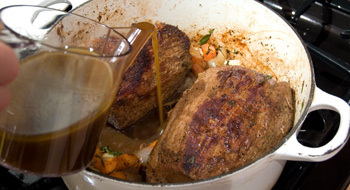 The roast should always be half-submerged in the cooking liquid. Uncover the pot and remove the roast to a carving board; slice the roast thickly and place on a platter. Arrange the vegetables around the roast. Meanwhile, reduce the cooking liquid to one-third of its original volume over a high flame. Marinating the hens in beer for 2 days tenderizes them and flavors them deeply. Rinse the hens under cool water. Rub with the cut lemons. 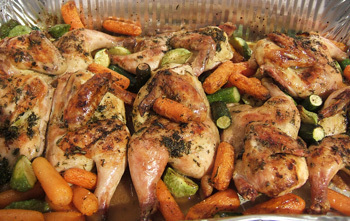 Place the hens in a wide roasting pan and drop the squeezed lemon halves in the roasting pan. Drizzle the hens with the olive oil. Pour on the beer and season with the pepper, fennel seeds, thyme, rosemary, tarragon, and marjoram. Cover with aluminum foil and refrigerate 48 hours, turning every few hours. Return the hens to room temperature before roasting. Preheat the oven to 450 degrees. Uncover the hens and surround with the baby vegetables. Season the hens and vegetables with the salt. Roast in the preheated oven for 1 hour, or until the hens are done; the breast should be golden-brown and the thickest part near the thigh should register 180° when a meat thermometer is inserted. 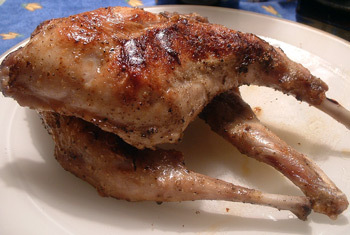 Be sure to baste the hens with the cooking juices every 10 minutes or so during cooking for best flavor and texture. Allow the rabbit to marinate for at least 24 hours to tenderize and perfume it; and don't forget to pass lemons around the table for squeezing over the fragrant fire-kissed meat. Toss the rabbit with the fennel, rosemary, thyme, oregano, chili, pepper, garlic, olive oil, and vinegar in a alarge container. Refrigerate 24 to 48 hours, tossing once in a while. Heat a grill to a medium-high flame. Season the rabbit with the salt. Grill the rabbit until browned on the outside and cooked all the way through, about 35 to 40 minutes, turning often to ensure even cooking. 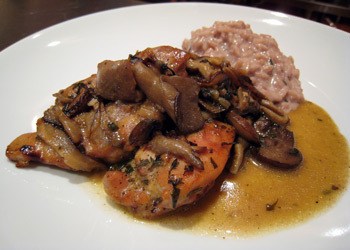 Be sure to save and strain the soaking liquid from plumping the dried porcini: it will add an incredibly earthy flavor to the sauce for the chicken. You may also want to incorporate a handful of sauteed cremini mushrooms to add more body to the sauce. Using a small paring knife, make 2 incisions in each chop. In a small bowl, combine the garlic and rosemary. Insert the mixture in the incisions. In another bowl, combine the fennel pollen, pepper, and olive oil. 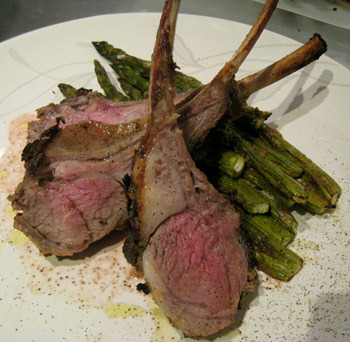 Place the rack of lamb in a 10-inch x 14-inch roasting pan and rub it with the olive oil mixture. Cover and refrigerate 48 hours, turning once in a while. When you are ready to roast the lamb, rub it with the salt. Roast in the preheated oven 25 minutes, or until the internal temperature registers 140° (cook longer if you desire the lamb well-done). Be sure to save and strain the soaking liquid from plumping the dried porcini: it will add an incredibly earthy flavor to the sauce for the chicken. 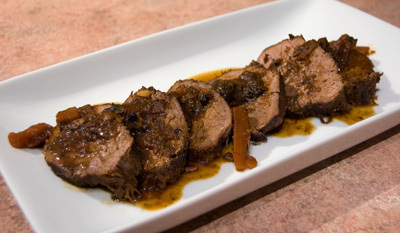 You may also want to incorporate sauteed cremini mushrooms to add more body to the sauce. Place the chicken in a large container. Add the wine, onions, garlic, bay leaves, thyme, and sage. Set aside in the refrigerator for 24 to 72 hours, turning every 8 hours or so to coat well with the marinade. When you are ready to cook, soak the dried porcini mushrooms in 2 cups of warm water for 30 minutes; drain, straining the water through a cheesecloth-lined sieve to eliminate grit, and reserve the soaking water. Rinse the mushrooms, then chop coarsely. Heat the olive oil in a deep, heavy 3-quart pot over a medium-high flame. Drain the chicken from the marinade (reserve both the solids and the liquid) and blot it dry. Add the chicken to the hot olive oil and sear on all sides, turning to cook evenly. 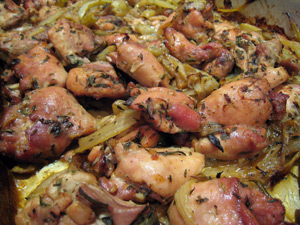 Add the soaked dried porcini mushrooms, onions, garlic, bay leaves, thyme, and sage from the marinade to the chicken; cook until the onions are wilted, about 10 minutes, stirring often. Add the cremini mushrooms at this point if using; saute for 10 minutes, or until softened. We have a lot more recipes! Visit our recipe index.